We've probably all seen the virtual technology that retailers are now using to help consumers try on clothes, making the process of online shopping a little bit less of a crapshoot. This virtual technology trend is no longer just limited to clothing, though, it's now being used to help people try on furniture and accessories as well. That's the idea behind Modsy. Founded in 2015, the San Francisco-based company is a home design solution that takes a technology centric approach to design. On Tuesday Modsy announced that it had raised an $8 million Series A funding round led by Norwest Venture Partners with participation from existing investors and prominent angels including Eoin Harrington (SVP, Restoration Hardware), Joe Kraus (Google Ventures), Joanne Wilson (Gotham Gal Ventures) and Pascal Levensohn (Dolby Ventures). With this round Modsy has now raised a total of $11.75 million in venture funding. It was also announced that said Jeff Crowe, Managing Partner at Norwest Venture Partners, will be taking a seat on the company's board of directors. I spoke to Shanna Tellerman, CEO of Modsy, about the problem she is trying to solve, and how she wants to distrupt the home design space in the next few years. VN: What is the problem that Modsy is trying to solve? How does it solve it? ST: Modsy is the first service in the home design space that puts everyday consumers in the driver’s seat of their own designs. There’s a huge gap right now between what products are available in the market and what they will look like in your home and Modsy aims to change all of this by taking a technology-centric approach to design. While sites like Pinterest and Houzz are great for inspiration, these ideas don’t translate easily into your own homes. Additionally, many people don’t want to hand over their design choices to a third party, so Modsy allows everyday consumers to envision and create a beautiful home easily and on their own terms. Modsy uses photorealistic 3D rendering tools and virtual reality to allow consumers to see and feel how products and furniture would look inside of their own homes and feel confident about their choices. Similar to how virtual technology is being used to help consumers try on clothes, Modsy's technology allows consumers to "try on" coveted furniture and accessories within the context of their homes. VN: Who is the typical customer for Modsy? Walk me through how they would use it. The typical customer for Modsy are men and women aged 25-45 who are going through new life stages whether they are moving into their first apartment, having their first child or buying a home. These customers would use the site to buy furniture and visualize how they want to design their homes. They would use the product by taking a few photos of the room they want to design. Then, they would take a style quiz so Modsy can better understand their preferences and tastes. Modsy would then provide the customers with a visual and shoppable web page of design choices set in the context of the room they want to design. This makes it easy for consumers everywhere to transform their space in ways they never thought imaginable. VN: How many customers do you currently have in all? ST: We have thousands of beta users and our numbers are increasing everyday. VN: What will you do with the money you've now raised? Will it go toward hiring? Expansion? Product development? Please be specific. ST: The funding will help recruit the most talented graphics engineers, 3D artists and designers from across the country. We will also use the funding to ramp up marketing efforts and scale the company as we lead up to a public launch. VN: What will Jeff Crowe bring to the company as a member of the board of directors? ST: Jeff has been a great partner to our company from the very beginning. He has been incredibly excited and is willing to double down on the business. VN: What separates Modsy from other similar companies? What do you do that they can’t or won’t? ST: The biggest differentiator between Modsy and other companies in the home design solutions space are its ability to offer a personalized design experience. 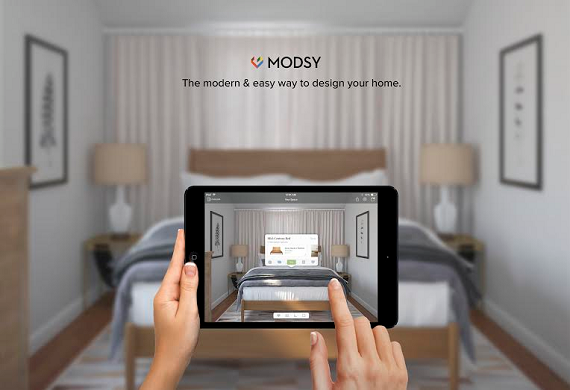 By using computer vision, 3D capture and photo-realistic 3D rendering tools primarily used by today's leading film and gaming companies, Modsy takes a technology-focused approach to home design and creates an experience that everyday consumers can use. Additionally, Modsy is the first design service in the space to give consumers a holistic view of how all of the components of a room will work in unison together, at no risk to them. This in turn, empowers consumers to take risks and push the envelope to achieve designs they never thought possible. VN: Why is what Modsy does valuable to its customers? Have you calculated any ROI in terms of money or time saved? ST: Modsy’s core value proposition is being able to help consumers visualize how furniture will look in their home, without the risk of having to spend a ton of money or do the heavy lifting. It’s difficult to understand scale and how products will look once they arrive in your room and Modsy’s 3D technology is key to making sure you can really see how your furniture fits. VN: How would you like to disrupt the home design space in the next five or ten years? Where would you like to take it? ST: There's a tremendous opportunity for Modsy's advanced model technology to impact e-commerce categories beyond home design. We believe Modsy will transform the way we shop for furniture in the future and enable consumers to see things in their own space before they buy them.